Climatological tornado alleys across the United States. Research has identified at least four significant zones of tornado activity. This is probably a more precise depiction of where these active regions really are. The vast expanse of the southern Great Plains from central Texas through Oklahoma, Kansas, and Nebraska have become synonymous with tornadoes. The legend of “Tornado Alley” has become ingrained in the American consciousness. This association has been fed by popular culture, with Hollywood movies from the Wizard of Oz to Twister. It’s not without merit either; this region sees more tornadoes than anywhere else in the world, statistically. However, in reality, there isn’t just one “Tornado Alley.” In fact, the two largest and most significant tornado outbreaks in recorded history happened not in the Great Plains, but in the Ohio and Tennessee River Valleys. In the south, there is an intense tornado hot zone that runs from northeastern Louisiana through central and northern Mississippi, northern Alabama, and northwestern Georgia (and sometimes portions of Tennessee are also included). This region doesn’t get any Hollywood movies made about it, but throughout history it has been ravaged by tornadoes. 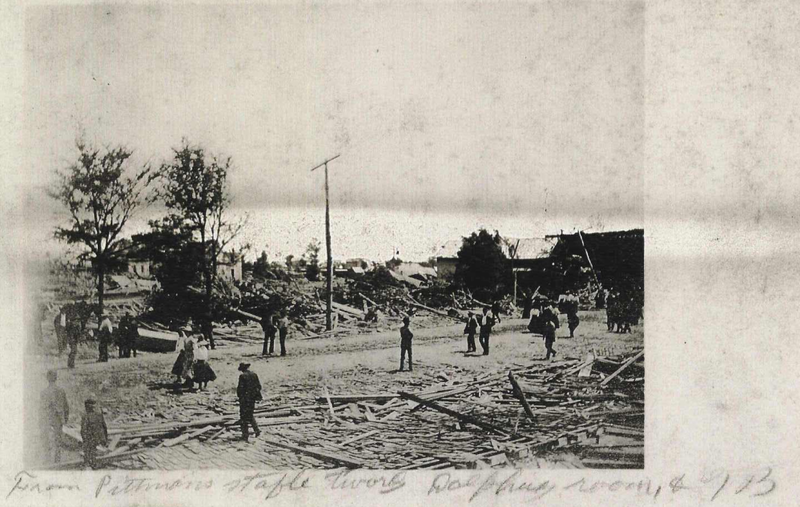 Devastation in Albertville, Alabama after an F4 tornado struck the town during the Dixie outbreak of April 24, 1908. This tornado killed 35 people and 324 died during the outbreak, which took place almost entirely within Dixie Alley. An outbreak on the Plains the previous day produced an F5 in Nebraska. Plains Alley, the traditional “Tornado Alley,” is nearly twice as large as Dixie Alley, but between 1950 and 2003, Dixie Alley had over a hundred more strong tornadoes (EF3 or greater) than its more well-known counterpart, or roughly 25% more, and 43% of the total tornadoes between the two regions. Since that time, 26 violent tornadoes (EF4 or greater) have struck Plains Alley. Dixie Alley has had 31. The state of Texas has not had an F5/EF5 tornado since 1997. Since that time, Alabama has had at least three (granted, Oklahoma has had at least four…Oklahoma has been the dominant hot spot west of the Mississippi over the past 12 years). However, in the Great Plains, the activity is more widely spread. In Dixie, the intensity is relatively focused on a small area. According to a study by Mississippi State University, south-central Mississippi has the highest likelihood of a tornado hitting within 25 miles of any given point than anywhere else in the country. 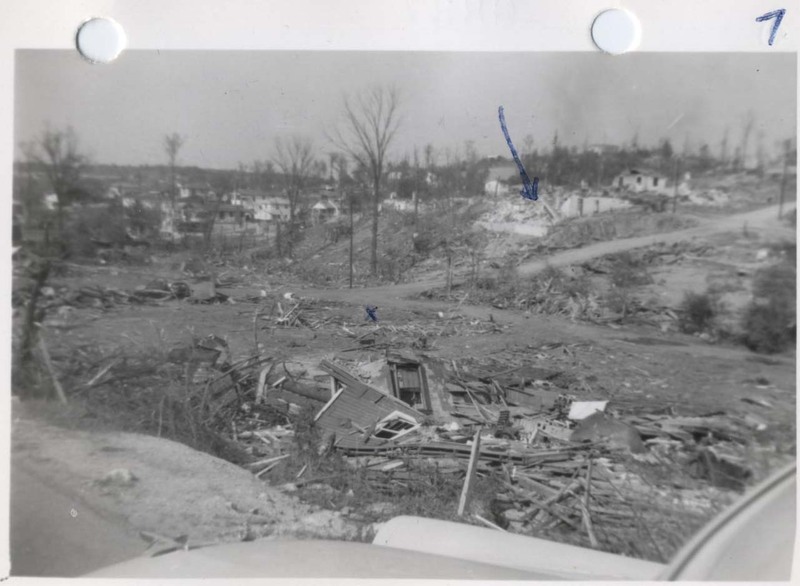 Total destruction in the Stacy Hollow neighborhood near McDonald Chapel after the April 15, 1956 tornado. However, the most dramatic difference between Dixie Alley and Plains Alley is the devastation. Dixie Alley is half the size of Plains Alley but is home to seven million more people. Four of the top ten deadliest tornado outbreaks took place almost entirely in Dixie Alley. Three others had at least two strong tornadoes kill at least 20 people in Dixie Alley. Between 1950 and 2013, 716 people died in tornadoes in the state of Alabama, far and away the highest toll of any state. There is a particularly severe section that includes central and northern Mississippi and Alabama, and extreme south-central Tennessee. This region has been ravaged by an astonishing 13 F5/EF5 tornadoes (not counting Tuscaloosa) all time and 50 F4/EF4s since 1950 alone, with major outbreaks also occurring in 1908, 1920, and 1932. This compares favorably to a similar section from central Oklahoma north into central Kansas (along the I-35/135 corridor I like to call “F5 Alley”). Also, interestingly, seven of the top 11 longest-lived tornadoes ever reliably documented occurred in Dixie Alley. Homes in the Smithfield neighborhood on the north side of Birmingham vanished during the 1977 F5 tornado. The cities of Birmingham, Alabama and Moore, Oklahoma are the only cities to have been struck by an F5 tornado twice. 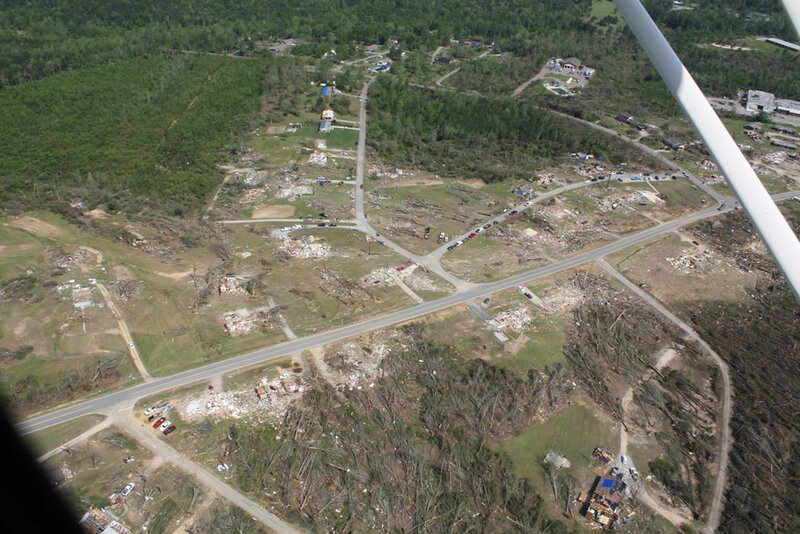 The community of Tanner, Alabama, has been impacted by as many as three (including two in the span of 45 minutes during the Super Outbreak of April 3, 1974…the monstrous Hackleburg tornado of the April 27, 2011 Super Outbreak caused high-end EF4 damage just SE of Tanner, however the rating of the second 1974 tornado is controversial). Jefferson County, Alabama has been struck by five violent tornadoes since 1950, tied with Cleveland County, Oklahoma for the most of any county in the country. Oklahoma City is synonymous with powerful tornadoes. The principle metro area of OKC has been hit by five violent tornadoes in recorded history (1912, 1930, 1942, 1945, 1999), and only one since 1950. Birmingham (which, for the record, is four times smaller than OKC) has also been hit by five violent tornadoes, all of them since 1950 (1956, 1963, 1977, 1998, 2011). Moore, which has been hit by two F5/EF5s and and F4 in the past 16 years, only had one significant event prior to 1999 (1893). Yet Oklahoma, Texas, and Kansas are the areas iconically associated with tornadoes, not Alabama. 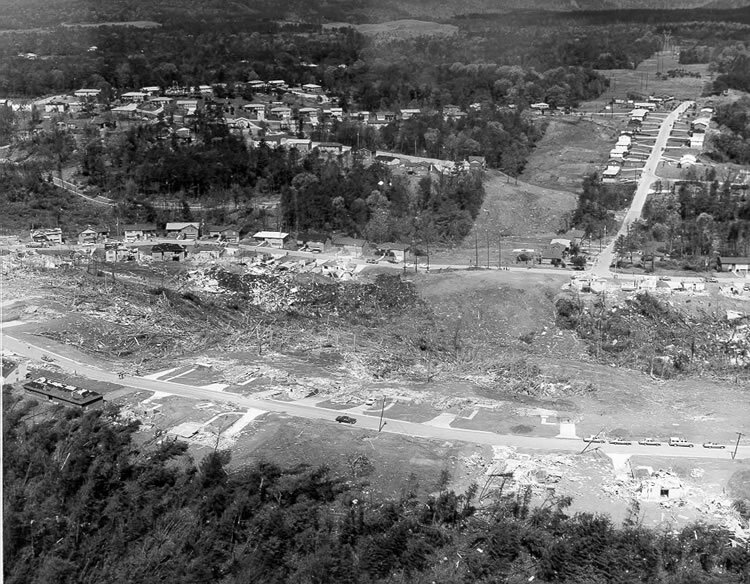 Aerial view of the devastation in Phil Campbell after the April 27 tornado. The point of all this is that it’s a fallacy to select any single area as THE tornado alley. The truth is, there are several “tornado alleys” and there’s limited statistical discontinuities between them. A region encompassing most of Indiana, central and northern Kentucky, western Ohio, and southern Michigan is sometimes referred to as “Hoosier Alley”. The upper Midwest of Iowa, southern and central Minnesota, most of Wisconsin, and northern Illinois is a particularly active area. Portions of it are sometimes incorporated into Plains Alley or Hoosier Alley. Pretty much anywhere between the Rockies and the Appalachians has a statistically significant risk of tornadoes. It’s important to bring awareness to all of these areas, not just the one’s we see in movies. It’s worth pointing out that only half of the ten deadliest tornadoes in recorded American history (plus ties) occurred in either Plains Alley or Dixie Alley. The big ones don’t just happen on the Plains, they can happen almost anywhere, so it’s important to know the risks no matter where you live. Today marks four years since the April 27, 2011 outbreak and we should never forget that it could happen again, but for our awareness, preparedness, and vigilance. This entry was posted in Uncategorized and tagged extreme weather, the South, tornadoes. Bookmark the permalink.